Bastian Schweinsteiger surprised everyone when he, all of a sudden, was spotted training in a pair of Adidas F50 Adizero, rather than his normally prefered Adipure 11Pro. It has been seen before, that stars experiment with new and alternative boots in the season-breaks, but now the midfield general has also given them their match début. Is there a startling move on the cards? The German Bundesliga is currently enjoying its winter break, but this doesn't mean the players are on holiday. Bayern Munich are on their annual training-camp trip in Qatar, where they are brushing off and refining, before the beginning of the spring-season. At the latest training-sessions, all of a sudden, pictures of the Bavarians vice-captain, Bastian Schweinsteiger, started cropping up and to our amazement he was wearing Adidas F50 Adizero. This was especially shocking, as the German has built up quite a reputation for being incredibly picky when it comes to football boots. The German international has been so happy with his old Adidas III, that he refused to shelve them. When they finally had nothing left in them, Schweinsteiger had a pair of exclusive Adidas Adipure 11Pro made, that were completely identical to the Adipure III, which he was so fond of. He have previously guessed at, that this must be because he has a deep-rooted love for kangaroo leather and since the Adipure 11Pro was made with Taurus leather, he was forced to stick to the old boots. 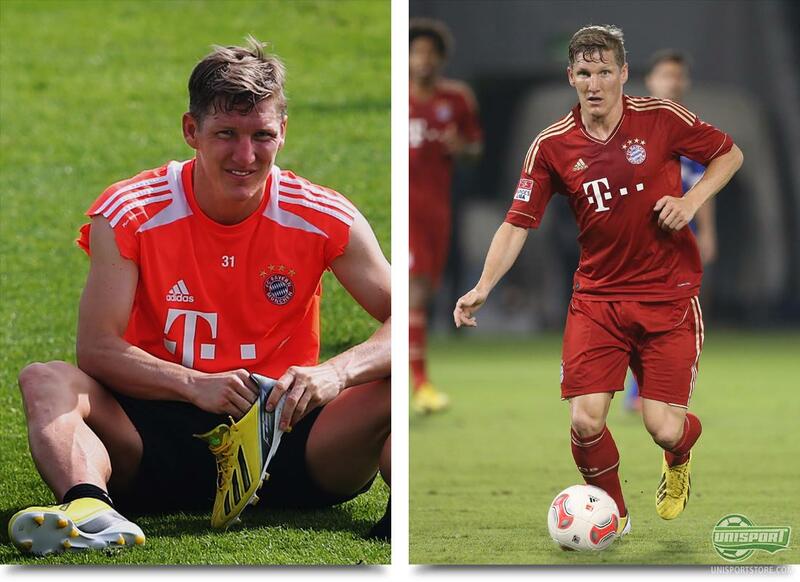 This theory was however sunk, as Bastian these days is making his trade in a pair of Adidas F50 Adizero. The upper on the speed boot is made with Goleo-leather, that in its own right is magnificent, but can't compete with the sheer quality of kangaroo leather. We therefore can't quite wrap our heads around, what reasoning there could be behind the sudden change, seeing as though it looks like a pair of fairly standard Adidas F50 Adizero, without any form of modification. Adidas have gone through fire and flame to keep their glitterati German happy and we think, that it would be much to the dismay of the Adidas, if Schweinsteiger was to leave the Adipure-silo, for which he has been a frontrunner for, for many years. All of this will be answered soon, because the beginning of the Bundesliga spring-season is not far off and we are truly on the edge of our seats, waiting to see what this gentleman will wear in the first game back. What do you think about Bastian Schweinsteigers sudden boot change? Is he an Adipure man through and through, or would the Adidas F50 Adizero suit him better? Tell us in the comment-section down below.